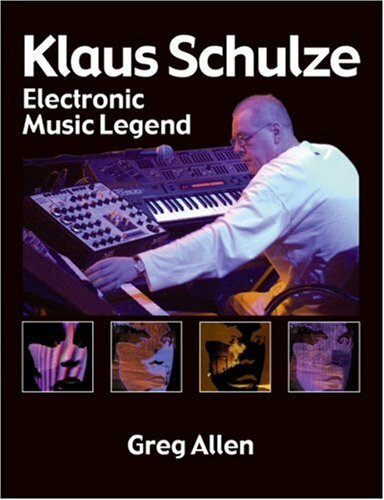 This new book about Klaus Schulze is a comprehensive discussion of the man and his music from an avid fan’s perspective. I am not sure who Greg Allen is, but he has compiled the information contained in this book from the Internet, interviews, personal experiences, and Klaus D. Mueller. The list of people interviewed is a rogue’s gallery of musicians who have worked with Klaus over his career: Harald Grosskopf, Dennis Rea, Joerg Schaaf, Michael Shrieve, Arthur Brown, Robert Rich, Julia Messenger, Thomas Kagermann, Kitaro, Marian Gold, Steve Roach, and of course the maestro himself Klaus Schulze. The sixteen chapters describe the social conditions and attitudes in Germany that led to the rise of Krautrock and Klaus Schulze’s unique career, the different analog synths and keyboards Klaus used early on, a chronology of his early life, and then Greg’s personal reviews of Klaus’ recorded output broken into 4-year chunks intercut with some interviews (1972 – 1974, 1975 – 1979, 1980 – 1984, 1985 – 1989, 1990 – 1994, 1995 – 1999, 2000 – 2004, and 2005 – 2007). The book closes with appendices providing lists of Klaus’ recorded and officially released concerts and the film tracks Klaus has scored. There are many photographs spanning Klaus’ career and album covers, mostly in black and white, but only eight pages of color photos. Many of these photos we’ve seen over the years on KS albums, articles, and the KS web site. There are some recent photos that have not been previously published that really show Klaus’ age. The 8 ½ x 11 size of the book allows for decent sized photos and makes this book a candidate for your coffee table. 1. I hate to fall into the trap of judging a book by its cover, but the beautiful cover led me to think that I would see similar color photos and artwork inside, but the book doesn’t deliver. Probably because they elected to go with basically copier paper which does not allow for good photo prints. A much better choice would have been glossy paper. Many of the details in the photos are lost by printing them using a black and white laser process. 2. The text is disjointed and does not flow smoothly from topic to topic or from paragraph to paragraph. I would have expected that the author’s approach to a biography would be to collect information from a variety of sources, analyze the data, and then write a coherent story in his own words. Instead we have many bulleted lists and text where Allen quotes someone talking about Klaus followed by another quote without any linking or transition language. It is almost as if Mr. Allen has never read a biography before. 3. The chapter about Klaus’ early equipment is particularly disjointed. To write this chapter all that Greg has really done was to copy and paste photos and descriptions from www.vintagesynth.com with the addition of a bare minimum of text making the descriptions relevant to Klaus Schulze. I am not exactly certain of the value of this chapter, because it really doesn’t come out in the text. The saving grace is Harald Grosskopf’s 1976 sketch of Klaus’ studio. 4. Interviews are fine, but they really should be published as standalone items in the book. Some of Greg’s are, but in other cases he snipped out a question and answer or two and inserted them in the middle of the text. That is not a typical method of conveying information. Normally an author will paraphrase an interview comment, integrate it into the story he or she is telling, and then footnote the source. 5. There are no footnotes of any kind in this book, which is surprising for a biography. Instead Greg uses a technique that I have never seen before. He references each source before he quotes it. This technique gets in the way of the readability of the book. He probably could have greatly shortened the book by using standard footnotes as some references are used more than once. It would also be nice for the reader if all of the references were collected in one location at end of each chapter or at the back of the book, which is standard procedure for most articles and biographies. 6. This book has no index, which is essential for the amount of information contained in this book. Neither are there any cross references or a glossary of terms that might be unfamiliar to the reader. Clearly this book was a labor of love for Greg Allen. All of the album reviews are quotes from the CD reissue booklets, his reminiscences and personal opinions, and sometimes quotes from Internet reviews. I would have expected more of an analysis of the music, the times, and the fans, not one person’s perspective. Despite the vast amount of information contained in this book, I was very disappointed with the result. This book is actually a vanity press, meaning anyone can contact Trafford Publishing, pay money, and have their book published. It definitely is not worth the price you have to pay.